sun Food broken slices pineapple. Mix all dried ingredients: the flour, backing soda and the salt. In another bowl mixt the butter and the sugar for 1-2 min, the eggs and vanilla.Add in this mixture the dried ingredients and mix it. Then add the milk and some drops of pineapple essence. Put this mixture into patty pans and add 2-3 pieces of pineapple and add them into the oven for 20 min. Mix the mascarpone for 1 min with the sugar. Add the cream and mix it easily. Use this cream to flourish the cupcakes. In another bowl melt the chocolate and add the pineapple pieces and put them into the fridge. 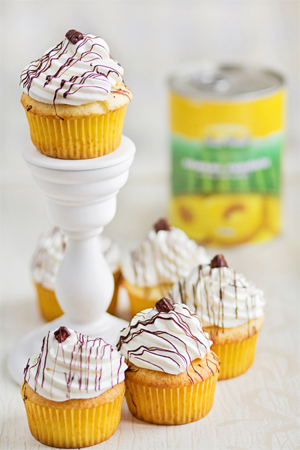 Use the remaining chocolate and the pineapple pieces to flourish the cupcakes.